The struggle for civil rights doesn’t begin in the Sixties. That’s just when it got loud enough for people to start hearing. The story of civil rights begins with small acts of defiance by courageous but otherwise ordinary people. Like Rosa Parks. 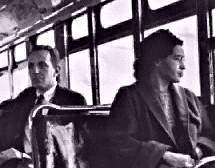 Rosa Parks, a 43 year old Black seamstress, refused to give up her seat on the bus to a white man. Which was illegal. And as preposterous as it sounds today – this was Montgomery, Alabama in 1955. So they arrested her. See, they figured you couldn’t let a thing like that slide. Might start something and “colored folks” might forget their proper place at the back of the bus. A small act. A mountain of reaction. The following night, fifty leaders of the Black community met at the Dexter Ave. Baptist Church to discuss the issue. Among them, a charismatic young minister with a vision – Dr. Martin Luther King Jr. They organized the Montgomery Bus Boycott which eventually cost the bus line 65% of its revenues. Eight months later the Supreme Court ruled that bus segregation was illegal. Parks, who had lost her job because of the boycott, moved to Detroit, Michigan the following year, and again took in sewing. She also worked as a fundraiser for the NAACP. 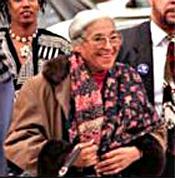 In 1965 she was hired by Congressman John Conyers, Jr., also a civil rights leader, to manage his Detroit office.